What a sad day yesterday as the iconic Notre Dame cathedral of Paris burned, and how terrible it is that it happened so close to Easter. Complete results of Beale Street Wine Race have been posted. Lafayette’s and Gold Strike tied for best in the parade. Sherito Thomas of Gold Strike was crowned Queen of the Vine. Tin Roof won the grape stomp, and Huey’s added to their list of wine relay wins. Downtown steakhouse 117 Prime is having an Easter brunch this Sunday from 10 to 3. Over on the island, River Hall at River Inn will have an Easter brunch buffet on Sunday. Union Row developers have acquired the corner of Union and Fourth, where the Powerhouse Motors building currently stands. 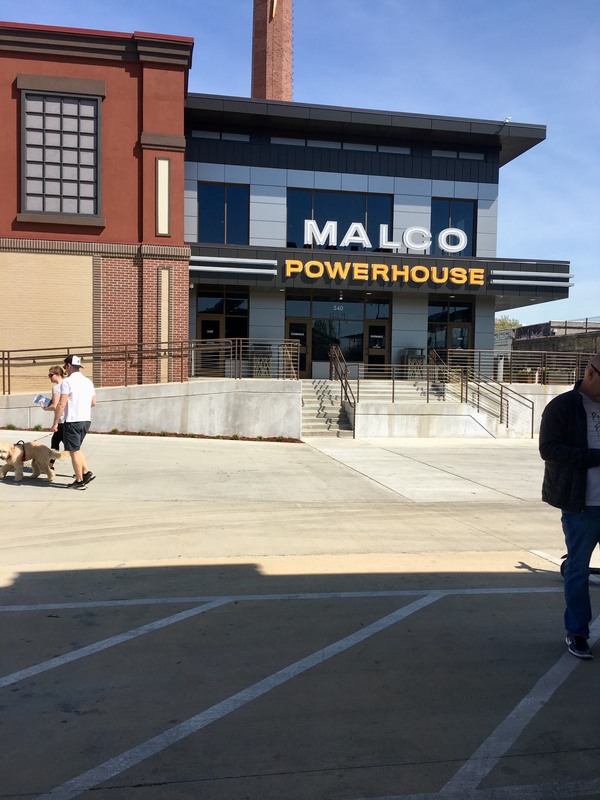 Powerhouse Motors will be moving to 500 N. Hollywood in the Broad Avenue Arts District. New Memphis is hosting a launch session on Tuesday, April 30 from 4 to 6 PM where you can get to know more about internships and careers with the Memphis Grizzlies. Camy’s, which delivers food to Downtown and Midtown, is hiring a delivery driver. That’s all the news I’ve got for today. Back tomorrow. The Moody Ques got together for a team “Meat” & Greet yesterday. It was a rainy day but we still had a good turnout, and there was plenty of delicious food. Our pitmaster, Kris, gave a presentation. 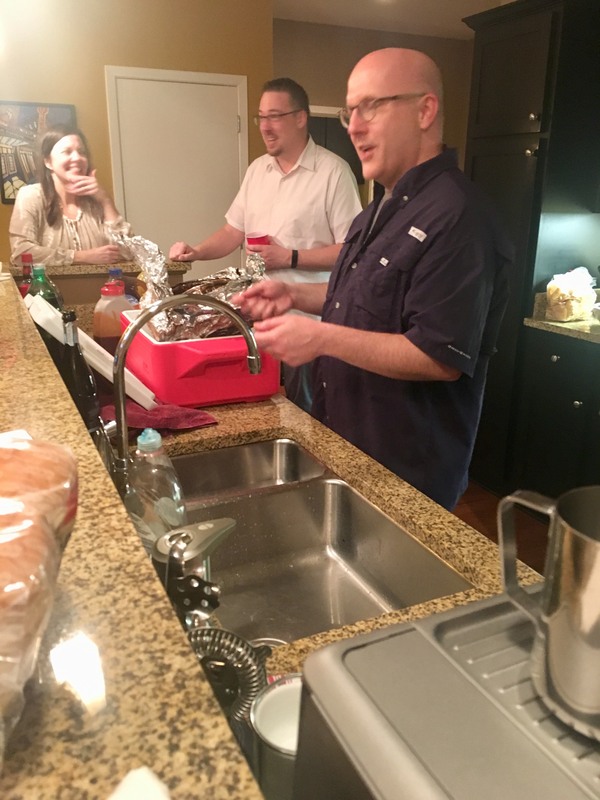 He talked about the cooking techniques our cook team used, as well as the sauce. He showed us how to pull apart pork and find “the money piece” that is the one you want to present to the judges. 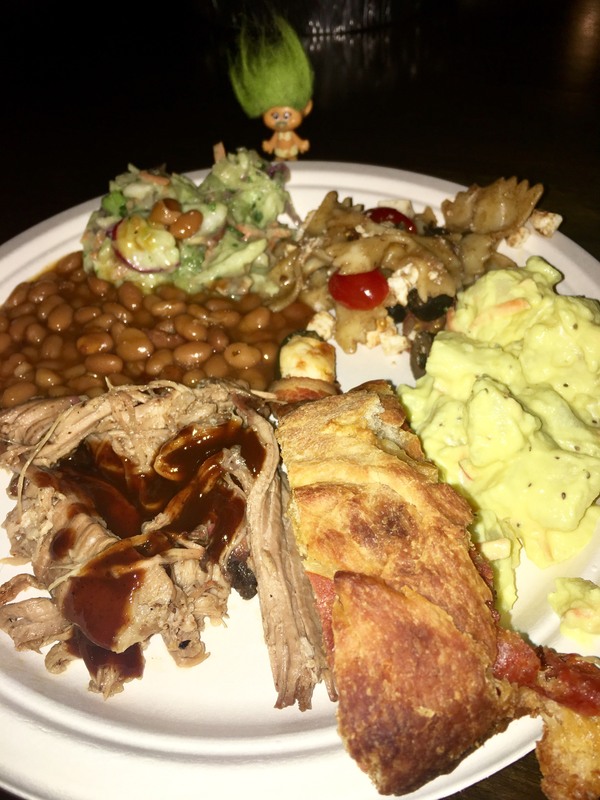 Senior Deputy Director of Public Relations Perjorie T. Roll enjoyed a plate of pulled pork, beans, a jalapeno popper, avocado bacon slaw, pasta salad, potato salad, and a pepperoni roll. We had yummy desserts too. 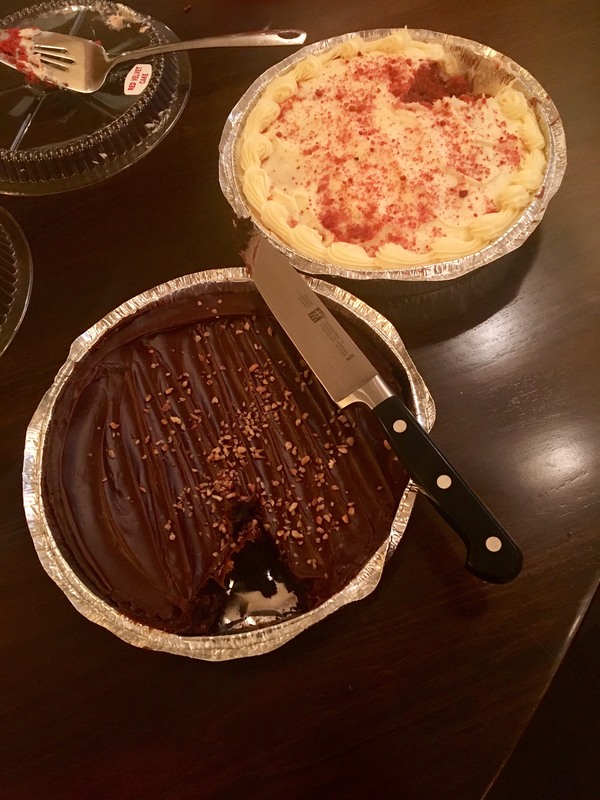 This get-together was a preview of the goodies members can expect to find in the Moody Ques booth. 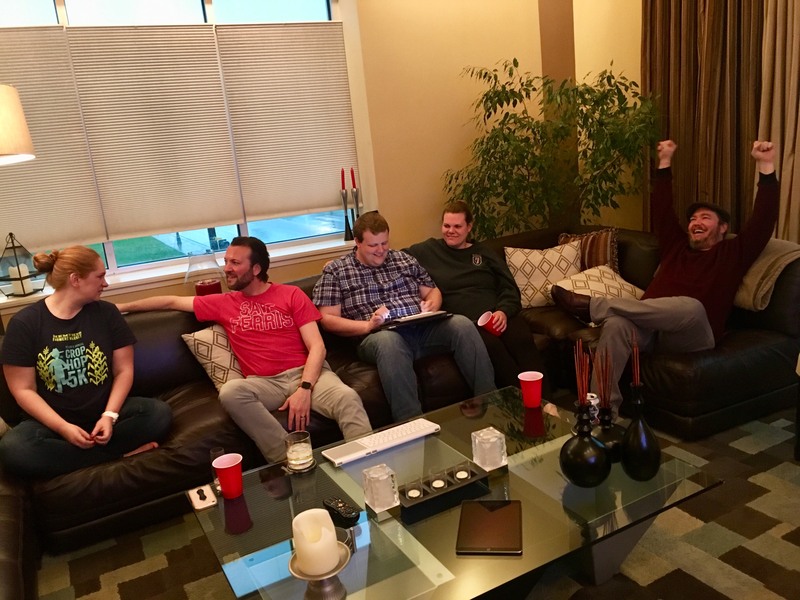 After dinner was gathered around and discussed team business: T-shirt design, liquor sponsorships, things like that. It was a very productive meeting and we’re all looking forward to this year. View the complete photo gallery on the Moody Ques website. It was a rainy day but a good one. I led off at the Farmers Market, and I have to say the staff and the volunteers there are so wonderful, always make me feel right at home. After that I walked over to Max’s Sports Bar for a few PBRs. Then I headed south to Loflin Yard, where I got to hang out at my friend Stacey’s bar. Then the Meat & Greet, conveniently right down the street from Loflin, then got a Lyft to Blind Bear for their ’90s party. An opening parade, where all the teams line up and march into Handy Park. Best entrance/float wins the prize. Queen of the Vine, a beauty pageant. Girls from the participating bars and restaurants shake their stuff and answer questions asked by an emcee. Over the years it has been proved that keeping it classy is the way to win. Although, now and then there is a wardrobe malfunction. Weatherbug is calling for a temperature of 49 with a northwest wind at 1 PM, the usual starting time for QOTV where many of the competitors will have bikinis on. Yikes. A grape stomp. Each contestant gets a tub of grapes, and whoever produces the most juice in the allotted time wins. A four-person wine relay. The first person opens a bottle of wine, puts it on a tray, and runs to the other end. There a second person opens a second bottle of wine, adds it to the tray, and runs back. Same for the third and fourth person and the third and fourth bottle of wine. Both speed and how much wine was spilled are accounted for in the final scoring. Despite the cold weather, this event is always a lot of fun to watch. Pro tip: On the race route, there is a bar called Wet Willie’s that serves a daiquiri called a Call-a-Cab. You should get one, with two caveats: Absolutely do not drive after drinking this drink, and drinking more than one can lead to all kinds of bad behavior and possibly a trip to 201. 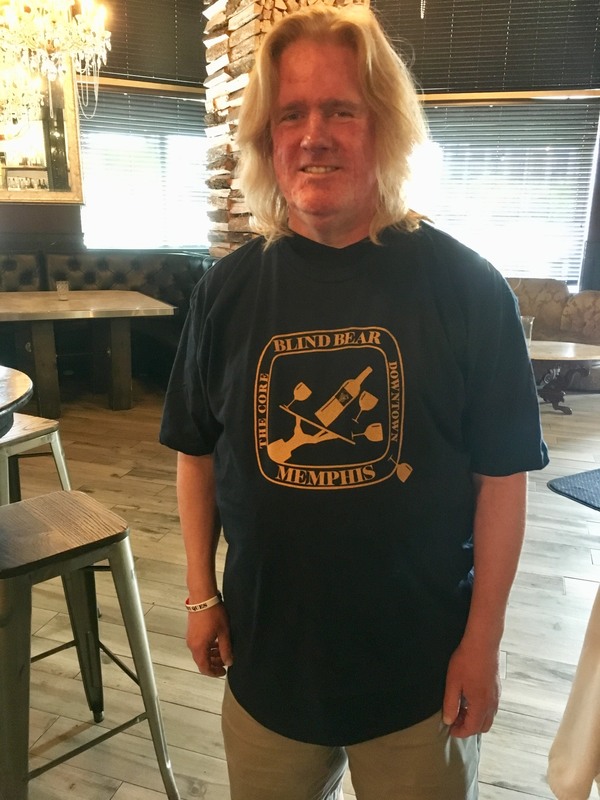 Time to get this day started and get ready to cheer for Team Blind Bear! Back tomorrow with more news. LOVE IT. 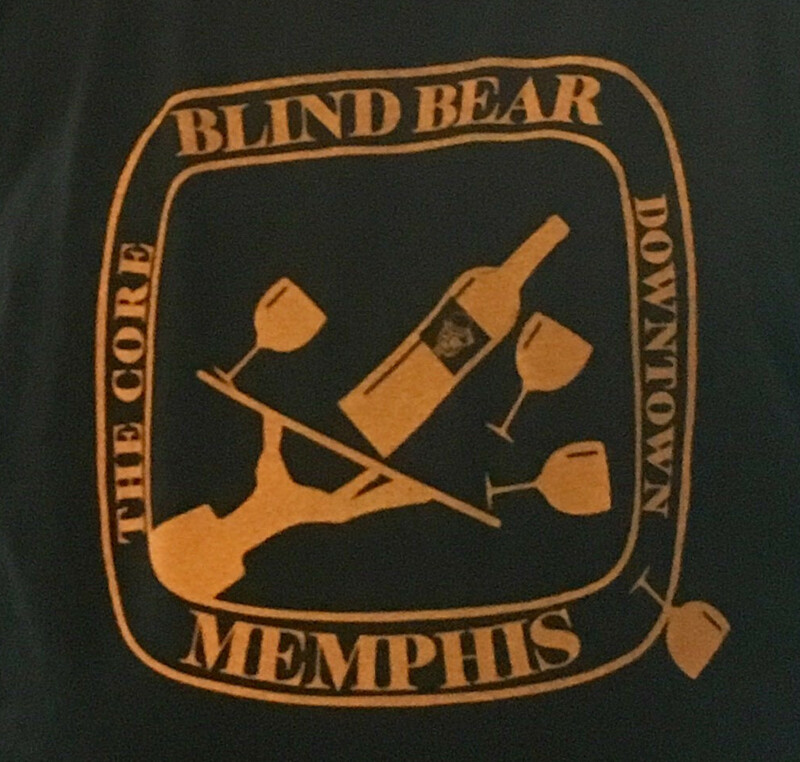 If there were a “Best T-shirt” competition at Wine Race I bet this shirt would win. Yesterday around 6 I was starting to get hungry, and my own blog helped me out. 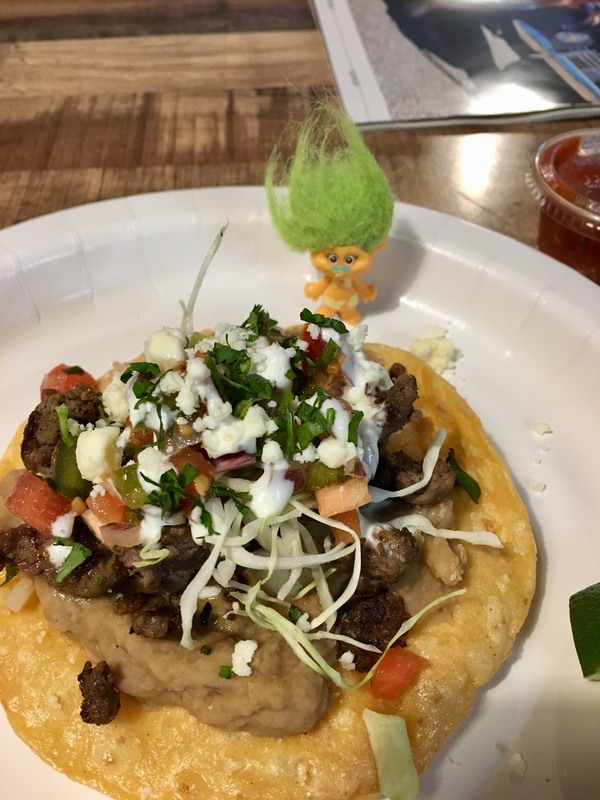 I remembered that I had posted that a new Mexican restaurant had opened up in the 409 South Main food hall, and I decided to walk down there and check it out. It’s called Venga and it’s in the upstairs part of the food hall, next to City Block Salumeria which operates the pop-up restaurant. Those molotes sounded interesting, so I got an order of them. I got a carne asada tostada too. 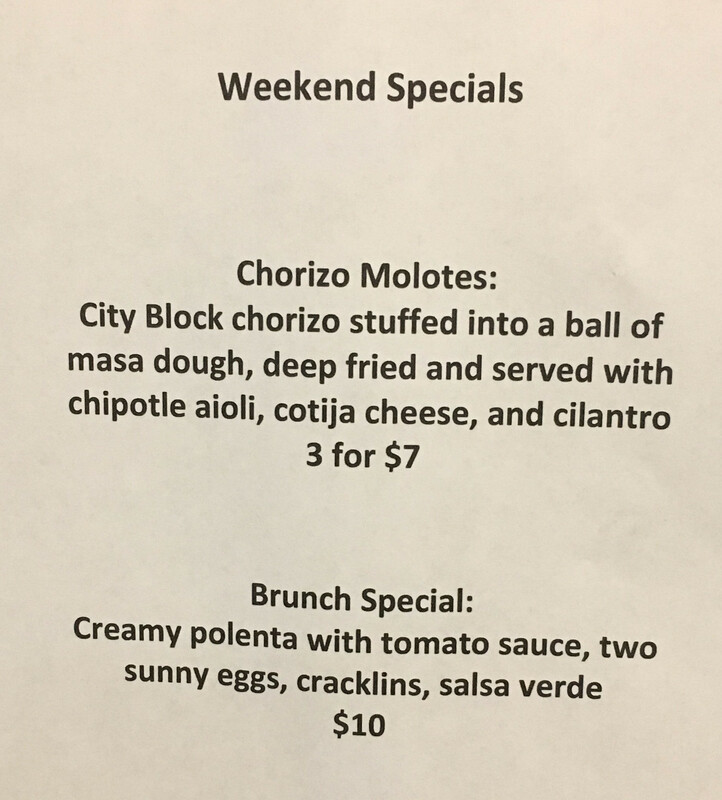 The molotes are available all weekend, I believe, and if you don’t have dinner plans yet for today, I would recommend getting down to Venga and trying these. The spiciness of the chorizo worked perfectly with the masa, and the cheese offset the spice just the perfect amount. It’s a treat to go to a Mexican restaurant and try a dish I hadn’t before. As for the carne asada tostada, it was delicious too. It came loaded with beef and beans and toppings for a symphony of flavor. There are some neat businesses in South Main Market, the place I often refer to on here as the 409 S. Main food hall. In addition to Mexican food at Venga and fresh butcher-cut meats at City Block Salumeria, there is Chinese-American restaurant Wok’n in Memphis and the Downtown location of coffee shop Java Cabana. Downstairs is Bar 409, the larger successor to previous bar The Civil Pour. There is plenty of space for two or three more restaurant concepts to open. It wasn’t busy when I went in there during the dinner hour Friday, and it made me wonder if Memphians have yet to fully appreciate what an asset they have in a food hall. In other cities I’ve visited or lived, the food halls tend to be right in the heart of their downtown district, whereas South Main Market is tucked away slightly off the beaten path. 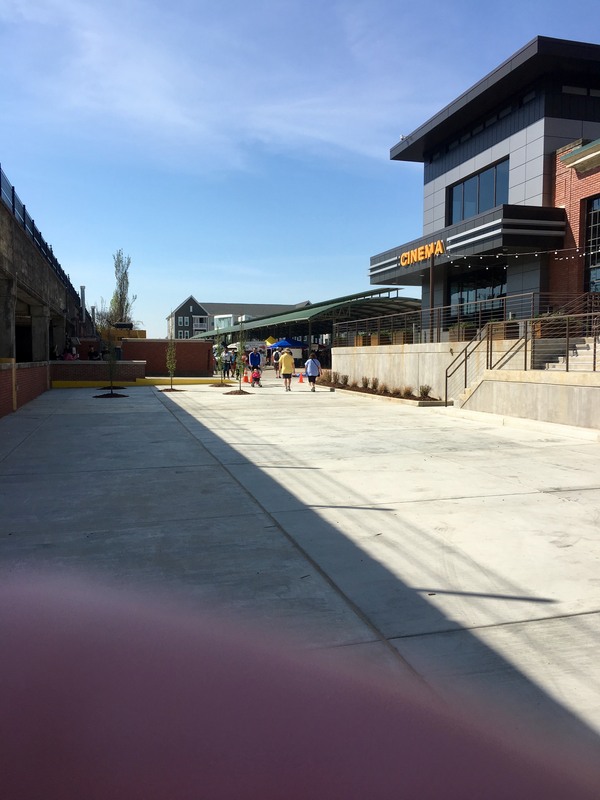 Now that the movie theater is open, I suspect there will be more foot traffic between the core and South Main, and the food hall will be more easily discovered. The food hall is a place where food entrepreneurs can begin living their dream without the full commitment of maintaining a stand-alone brick-and-mortar location. It has given existing restaurant operators a satellite space to operate, as it allowed Michael Patrick a place to feed his customers and pay his employees for a month when Rizzo’s had to go under construction. It’s a fantastic event space too. Walking back from South Main Market, I discovered that another Mexican restaurant is getting close to opening too. 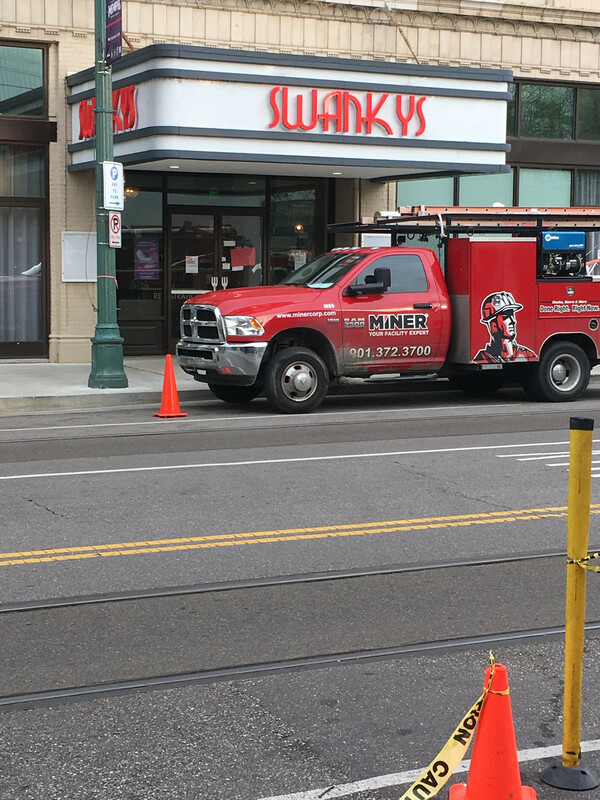 Swanky’s now has its sign up on the Chisca location. Kale, Yeah! is the theme at the Memphis Farmers Market this morning. 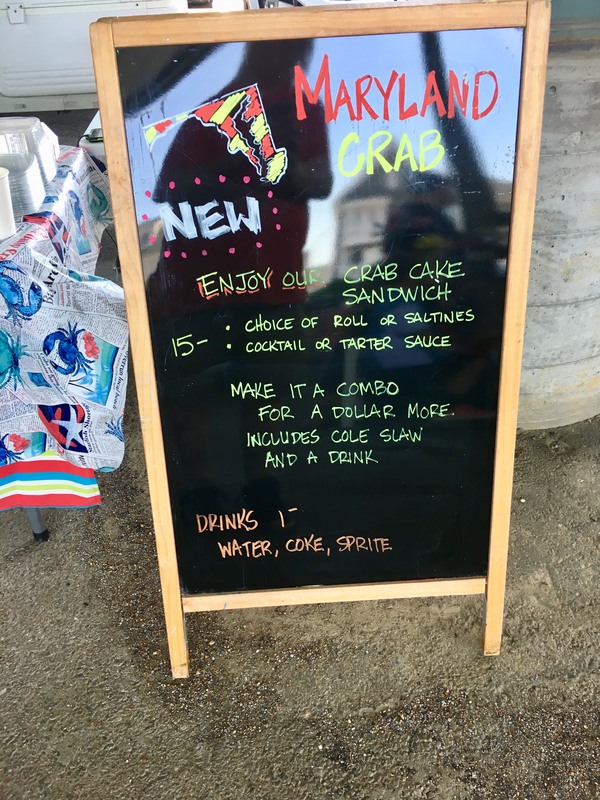 In addition to the produce vendors, the Fuel, Grub, and Mama D’s Oasis food trucks will be on site, and don’t forget about that Maryland seafood vendor selling the yummy crab cake sandwiches. There will be a Farm Fun crafts area for the kids, and live music by Katrina Burgoyne, K. Johns, and Anna Benson. The Market runs every Saturday under the pavilion at Front and G.E. Patterson, 8 AM to 1 PM. Did you know there’s a cafe in River Garden, the park at 51 N. Riverside next to the Tennessee Welcome Center? It’s open seven days a week from 9 AM to 5 PM. You just can’t make this stuff up: A coyote got stuck in a wall in the Cook Convention Center this week. Workers freed the coyote and released it into the wild. If you’re looking for an outdoor event Downtown tomorrow more tame and less debaucherous than Beale Street Wine Race, there will be sunset jazz in Court Square 6-8. A drawing yesterday put the Grizzlies in 8th place yesterday in terms of their odds for the NBA draft lottery. I have a BBQ team Meat & Greet on the south end of Downtown at 3, and I’m going to head to the south side early and make a day of it. 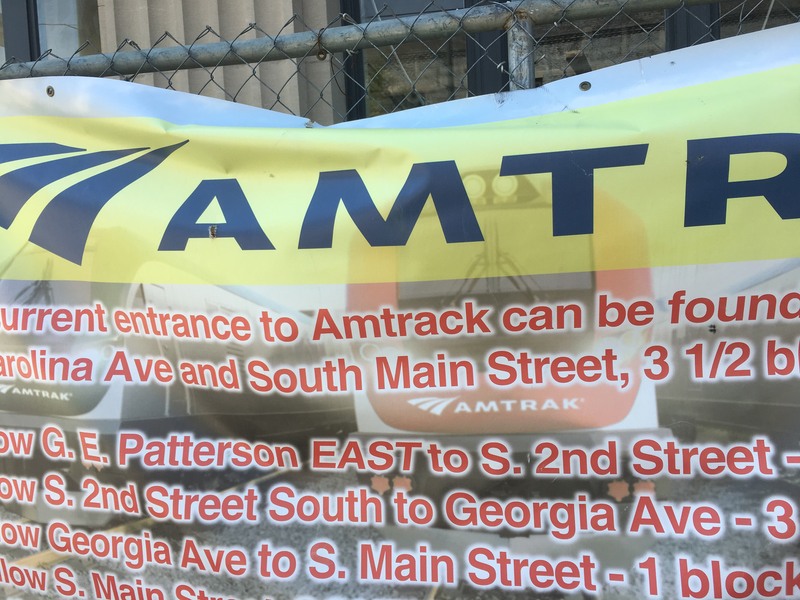 The Farmers Market, Max’s Sports Bar, possibly Earnestine & Hazel’s, and Loflin Yard will be by pre-party plan. Back tomorrow with more news and possibly some pictures. Chris Wallace and J.B. Bickerstaff have been removed from power. In Wallace’s case, the Grizzlies reassigned him, and Bickerstaff was fired. I’m with The Daily Memphian’s Geoff Calkins on this one: I don’t disagree with the decision (especially in the case of Wallace), but the manner in which the two men were notified was very troubling to players and fans. There will be a coin flip today to determine which teams are 7th, 8th, and 9th worst for NBA draft lottery purposes. New Orleans, Dallas, and Memphis are all tied with 33-49 records. I wonder how you do a coin flip when there are 3 possible outcomes? Yesterday I had some tourists ask about Blues City Cafe, and whether there are any hidden gems on the menu besides the obvious ribs and steaks. 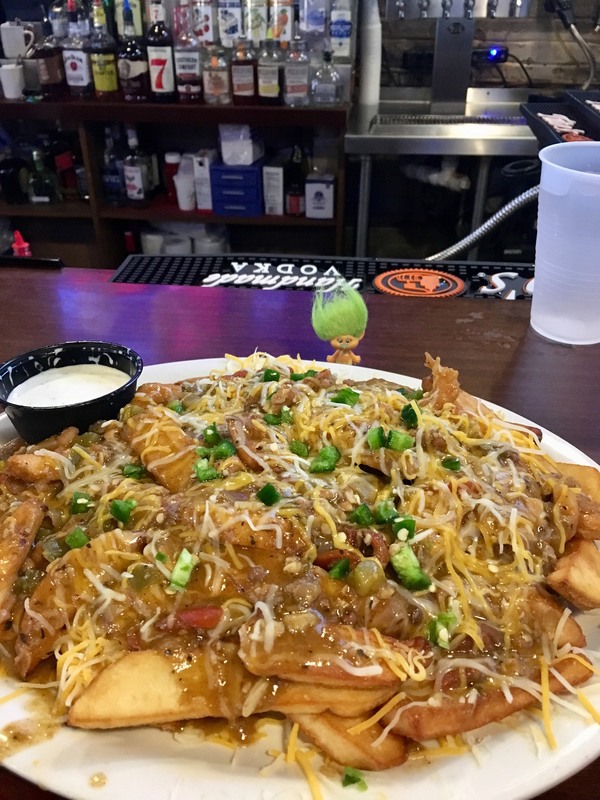 “Yes,” I said, “the gumbo fries.” This is a heaping helping of steak fries topped with Blues City’s legendary gumbo. I hadn’t had them for a while and decided to stop by Blues City last night for dinner. 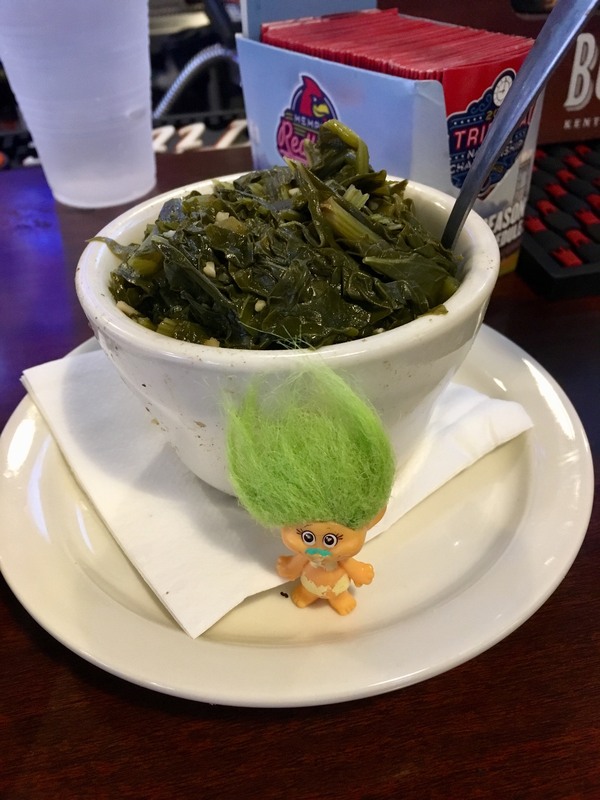 Because I need to eat more green vegetables, and because my troll likes foods the same color as her hair, I got a side of greens. 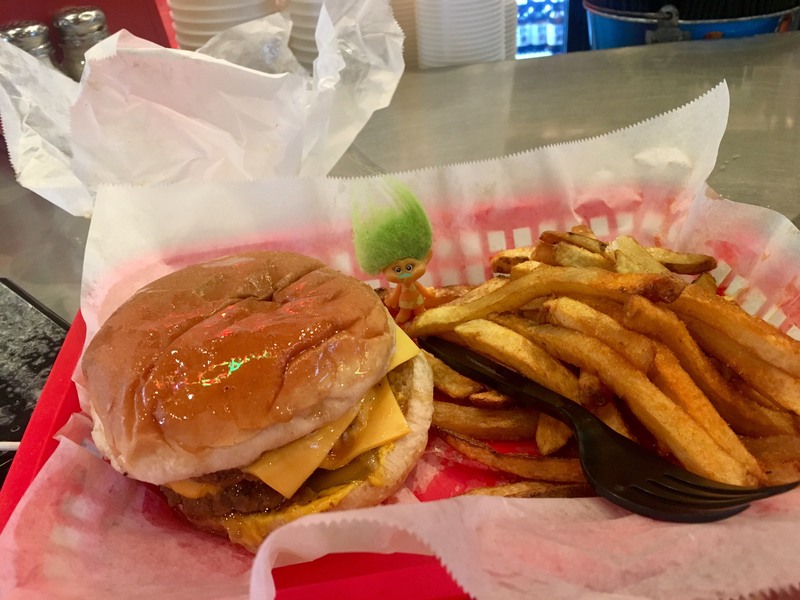 It’s easy for locals to overlook Beale Street when considering dining-out options, but there’s some good stuff on the street. My food was out super fast and the PBR was cold in a 16 ounce can. Ballet Memphis presents Giselle at the Orpheum this weekend. The last Drink-N-Draw game show ever happens at Ghost River tonight. The Adler apartment building at 267 S. Main is being renamed The W.L. for COGIC bishop W.L. Porter. Katrina Burgoyne, Matt Coppens, Robert Humphreys and Tim Lynch perform at Songwriter Night at South Main Sounds, 550 S. Main, tonight at 7 PM. Jennifer Biggs of The Daily Memphian became a chicken and waffles fan when she went to review Sage, the new soul food/fusion restaurant in the former Oshi space on Main. There will be a watercolor class with wine in Cordelia’s Market on Tuesday, May 14. Bar 409, the successor to The Civil Pour in the 409 S. Main food hall, is the subject of Jennifer Biggs’ Bar Talk this week, as bartender Keagan demonstrates how to make the Ancho & Lefty. 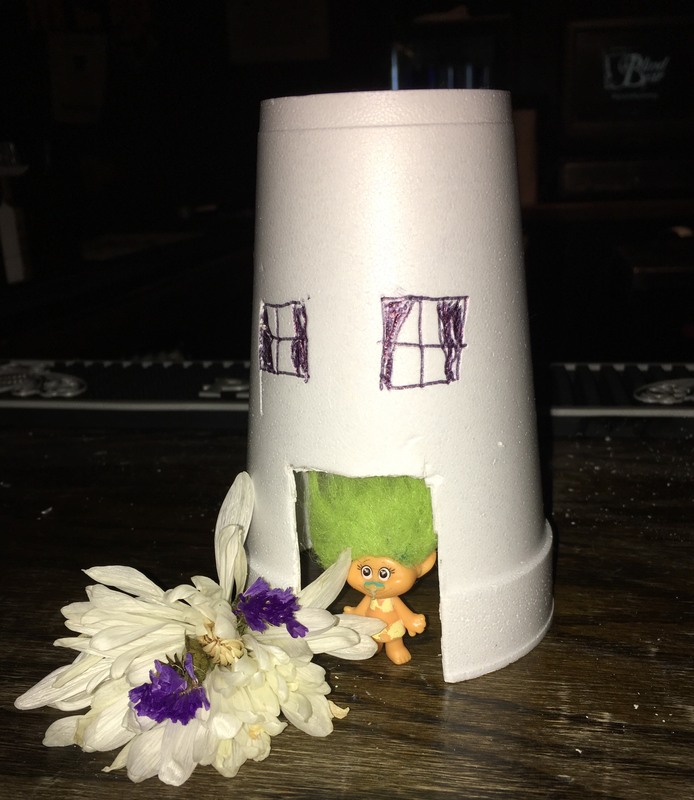 Yesterday I was at the bar at the Blind Bear for a bit, where Feeny asked, “where’s your friend?” and I pulled my troll out of my pocket. Feeny made her a castle. Some of the bars of the south end of Downtown are having a 4/20 pub crawl on Saturday, April 20. It’s free to participate. The Ghost River tap room, The Dirty Crow Inn, Loflin Yard, and Carolina Watershed are the venues. Taste of Science Memphis and Belle Tavern will host Science is Sweet and Sour Thursday, April 23 from 7 to 9 PM. Hear from a nutrition expert from UTHSC about how our bodies respond to what we put into them. Memphis in May has posted details about its Celebrate Memphis event happening Saturday, May 25 in Tom Lee Park. The City of Memphis and Shelby County turn 200 this year, and in celebration of the bicentennial, Memphis in May International Festival has broken with its tradition of saluting the history and culture of a country and will instead celebrate the rich culture and colorful history of Memphis at a unique event on Saturday, May 25, appropriately titled “Celebrate Memphis.” Produced in conjunction with the City of Memphis, Shelby County, and Memphis Brand Initiative, Memphis in May invites all citizens of Memphis and the surrounding communities to join the FREE city-wide celebration in Tom Lee Park. Some of you may have noticed that prices of the world’s greatest beer, Pabst Blue Ribbon, have ticked up slightly in recent weeks, especially on draft. I’m told that is because A.S. Barboro, which distributes PBR locally, was bought, bringing on the price increase. Check out catering company The Kitchen Guru and keep them in mind next time you need to plan food for an event. Actor, comedian, and writer Tom Segura will make a stop at the Orpheum Tuesday, September 10 on his Take It Down Tour. Backline Memphis, a showcase of original Memphis music, happens tonight at Tin Roof at 8. 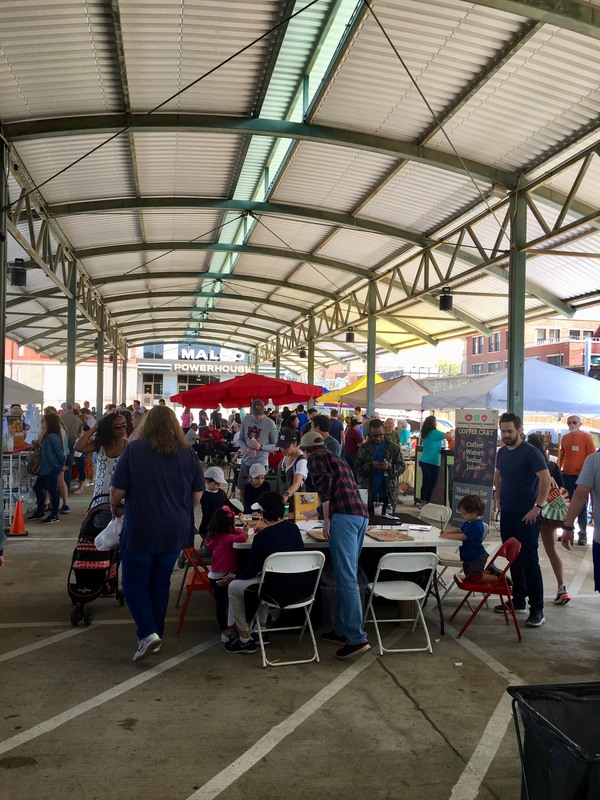 It’s organized by Mark Parsell, the same person who organizes the songwriter nights at South Main Sounds and the music at the Memphis Farmers Market. If you missed the debut episode of Championship Wrestling presented by Pro Shingle on CW30 last Saturday at noon, it’s on YouTube for your watching pleasure. There’s a new pop-up restaurant called Venga in the 409 South Main food hall making tacos and tamales. It’s a City Block Salumeria project. The I Love the ’90s pub crawl happens this Saturday. Participating bars include Tin Roof (registration 3 PM), Alfred’s, Blind Bear, Coyote Ugly, Silly Goose, and Wet Willie’s. Cristina of the City Tasting Tours reports that Curry N Jerk next door to McEwen’s will reopen soon. She notes that they have space to accommodate large groups. The Office Depot on Union in the Medical Center District is closing. A source on Twitter said that as of yesterday morning, the shelves were still well stocked and there are many good deals to be had. Last night I met the guy who is opening the Swanky’s Taco Shop that is going in the Chisca in the former LYFE Kitchen location. He told me he is hiring servers, although the restaurant is still a few weeks from opening. I got his contact info and will pass it along if you’re interested in a job there. Email me at paul@paulryburn.com or hit me up on Facebook. Tonight is the first fireworks night of the season at the Redbirds. Prior to the first pitch (6:35, gates open at 5:00) fans can enjoy $2 beers at the Left Field Bar. First 500 fans receive a schedule poster featuring Adolis Garcia. After the game ends, stay in your seat for a fireworks show. Justin Timberlake posted his own local’s guide to Memphis, and he is a fan of Downtown. JT recommended The Arcade, Sun Studio, Gus’s, STAX Museum, Rendezvous, and Earnestine & Hazel’s. Memphis lost a Downtowner yesterday, but for a good reason. Jerry Stackhouse, formerly an assistant coach for the Memphis Grizzlies, has been hired as Vanderbilt’s head coach. That’s going to be a tough gig, competing with other SEC coaches and Penny Hardaway for recruits in the region. I wish him luck, though; I would love to see him build Vandy’s program to the point where he thumps Kentucky and Tennessee on a regular basis. 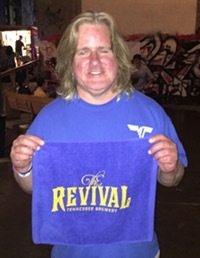 Play wrestling trivia for House Money in the Bank at Cerrito Trivia at Memphis Made Brewing Co. happens on Thursday, May 9. 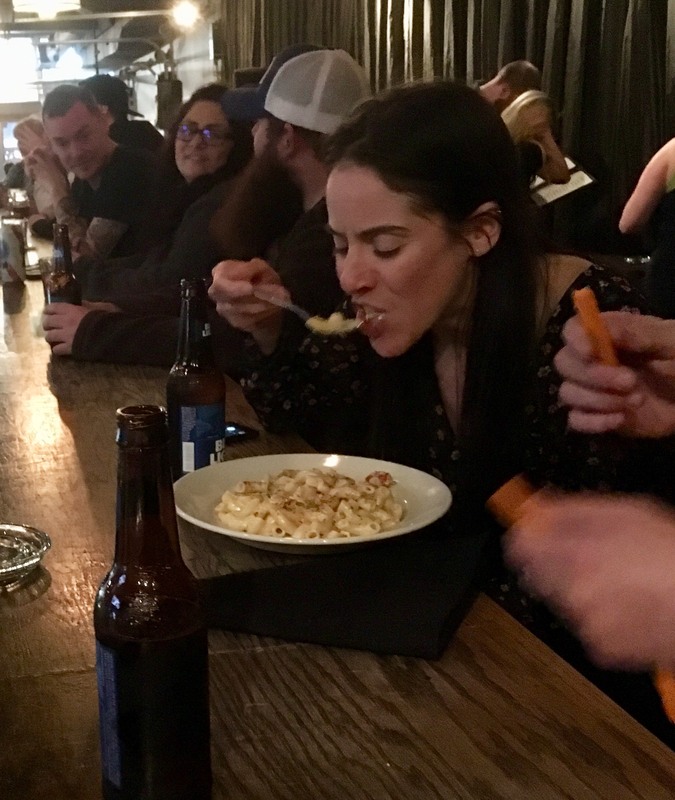 Normally I wouldn’t post about that so far in advance, but the wrestling trivia nights are extremely popular and you need to make a reservation. Open spots will fill up quickly. 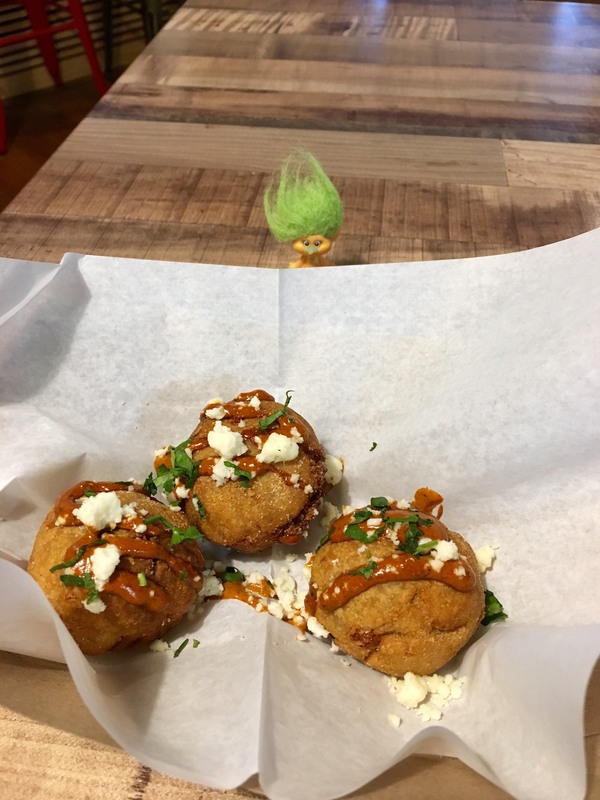 Edible Memphis posted a reminder that the Craft Food & Wine Festival is not far away, on Sunday, June 23 at The Columns in One Commerce Square. Tickets are $60-115 and get you a two hour tasting session at either 4:00 or 6:30. The festival has started to list the vendors and they are top-notch, including not only some of Memphis’ best food, but craft beer, cider, and wine. Money raised benefits the Church Health Center. Hmmm… the Craft Food & Wine Festival is the same day as The Bar Olympics happening out at the Hi-Tone. That’ll put some people to a difficult choice as to what to do that afternoon, and no, I am not kidding. Someone was asking me what the entry fee for The Bar Olympics is… I looked at the signup form and it’s $150 to enter a team of 6 to 8. Sign up the max of 8, and you’re talking less than $20 a person for an afternoon of drinking and competition. Quite a reasonable entry fee compared to similar events, and the money goes to Alive! Rescue Memphis. 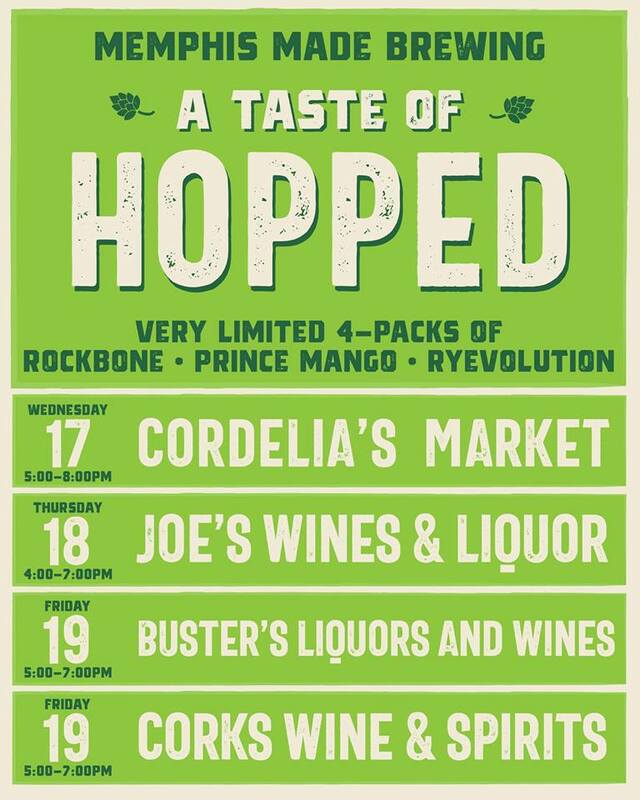 The Cousins Maine Lobster food truck will pay a visit to Cordelia’s Market this coming Wednesday, April 10, from 5 to 8. Wine lovers might want to make plans to take off work early this coming Monday, April 8. The Majestic Grille is having a cellar sale, selling some of the wines they currently have in stock at great prices to make room for new ones. The sale begins at 4 PM and goes on until 10, but you know the best bottles will get picked over fast! Tell your boss you have a dentist appointment and leave work at 3:30. Speaking of the Majestic, I was in there for lunch yesterday. 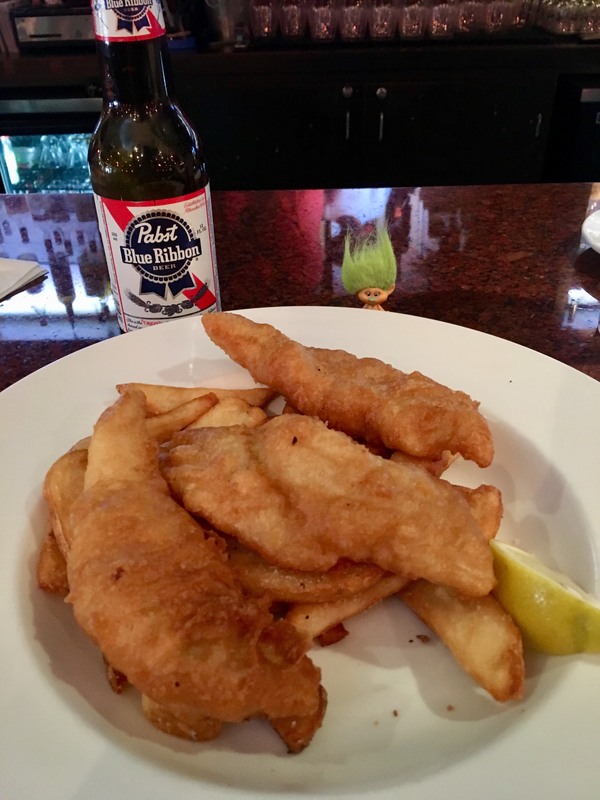 Can’t go wrong with a classic, fish & chips. 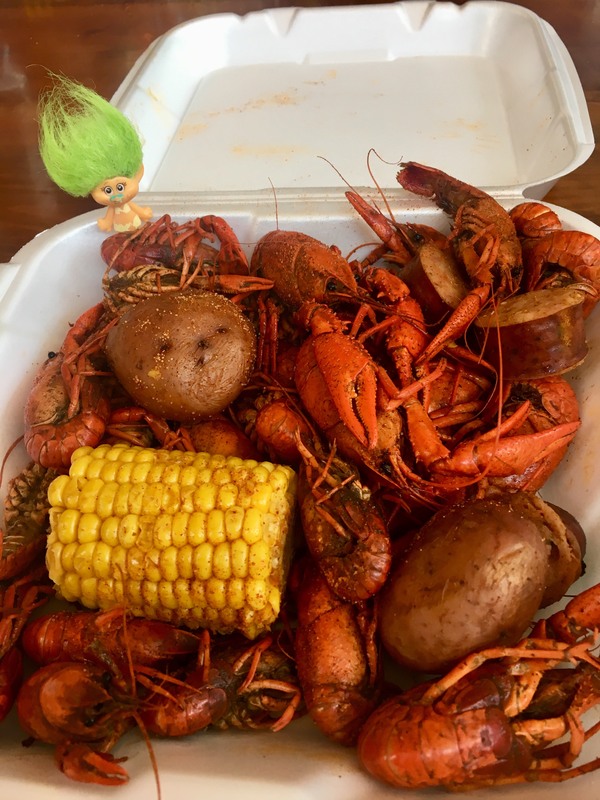 This was a special yesterday, but they tend to have fish & chips, along with other fish and seafood specials, every Friday, even outside of the Lenten season. Pro tip: Put some malt vinegar not only on the fish, but the steak fries as well. If you’re addicted to the Majestic’s famous thin Parmesan fries, you can get those instead of the steak fries. Farmers Market, Farmers Market, time to go to the Farmers Market! I’ll try to take a few pics. Back tomorrow with more news.